Lyle: You can watch the video clip to get a closer look. 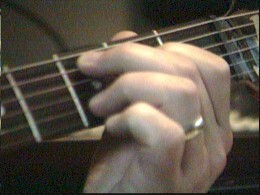 The right hand thumb and 3rd finger start the pattern, your index finger will pluck the 3rd string, and your middle finger plucks the 2nd string. 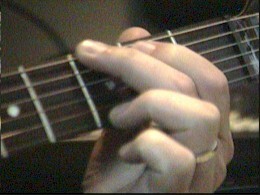 Lyle: In part 1 we used a D chord like this and moved it up the neck, using a basic picking pattern. 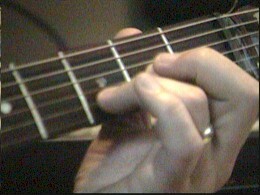 You can apply this pattern to the same lick. Here's the new tab, D - E - F - G.
Lyle: Try playing lick 1 along with the jam track. Here's a sample clip to listen to. 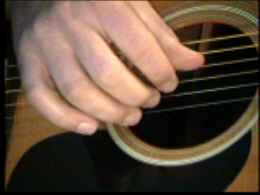 Lyle: With this new picking pattern, you keep your index, middle, and ring fingers on the same strings as before, but your thumb will move between the 6th, 5th and 4th strings, depending on where the bass note of the chord is. Look carefully at the tab. Lyle: Ok, now you have the new picking pattern, the chords and new jam track...let's start building upon it. As you'll notice in lick 3, you'll be playing the new pattern with all 3 chords in a progression. Lyle: We are in the Key of G. G is the 1 chord, Cadd9 is the 4 chord, and Dsus2 is the 5 chord, the 1 - 4 - 5 chords in G. The progression goes 1 - 4 - 5 - 4. Lyle: The minor chords in the key of G are: Amin, Bmin, and Emin, the 2, 3, and 6 of G.
Lyle: Lick 4 uses and alternate bass note for the second measure. You'll use the 5th string, 2nd fret for your alternate bass note for the G chord.